Congratulations! If you are reading this post, you or someone you know probably needs a Zofran pump. 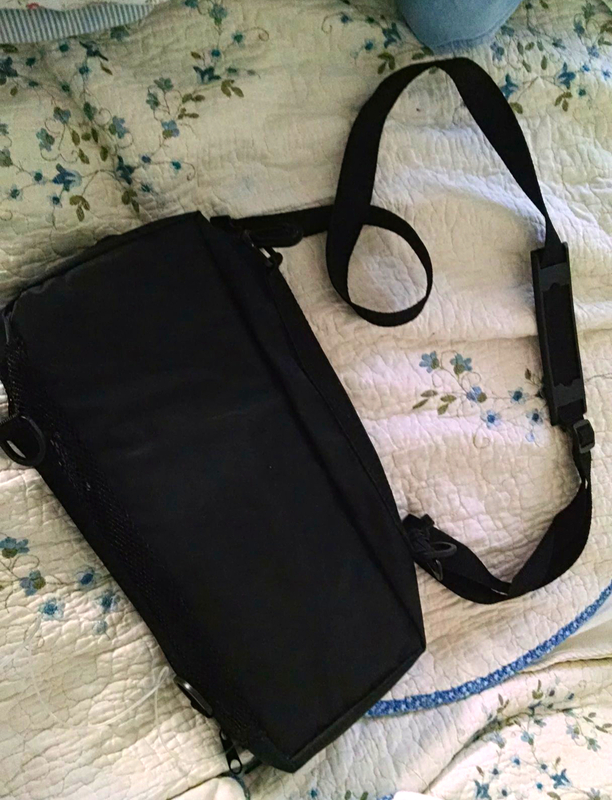 If you're using a Zofran pump, you're probably one of the 0.5-2% of all pregnant women who suffer from hyperemesis gravidarum. So, you can consider yourself one of the elite. The specially chosen. Regular readers know that this is my fourth HG pregnancy, but it is the first pregnancy that I've needed more than one medication to manage my symptoms. This pregnancy I have rotated through five different anti-nausea medications, and am currently on four different ones. Even while on multiple different medications, I still threw up and lost weight in my first trimester. I can only imagine how much worse it would have been without that medical support! So, first a really important note. Please, please don't comment on this post about the safety of Zofran. And please don't hound any HG moms in your life about it either. Zofran, and any other anti-nausea medications used to treat hyperemesis gravidarum, are not used lightly. Hyperemesis gravidarum is, historically and still in modern cases that are untreated, a potentially deadly condition. It is not to be taken lightly. Before current treatments, hyperemesis gravidarum was often a death sentence to women. Not so any longer! But it is still a very serious condition, that requires proper treatment to sustain the life of both mother and baby. No use of medication is without potential risks, but the risks of not properly treating hyperemesis gravidarum are far more significant. So, first of all, if you need a Zofran pump - all kidding aside - I'm sorry. I'm sorry your HG is so rotten that it's come to this. However...there is hope that it might make a big difference for you! So, it's also a little bit of a good thing, too. My second trimester is definitely more manageable than it was with my second pregnancy, and I think that the pump is playing a part. So, in my search, I could only find tutorials for one kind of Zofran pump. (Here's a great video tutorial for that other kind of pump.) 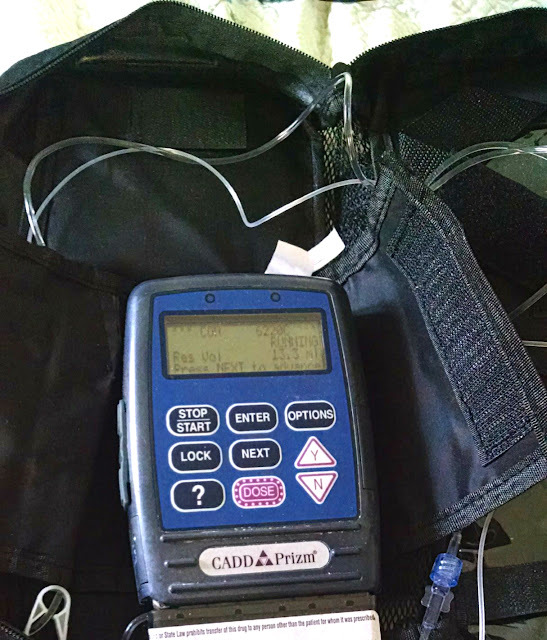 Then, my home health nurse showed up...with a different kind of pump. And I couldn't find any tutorials on it! 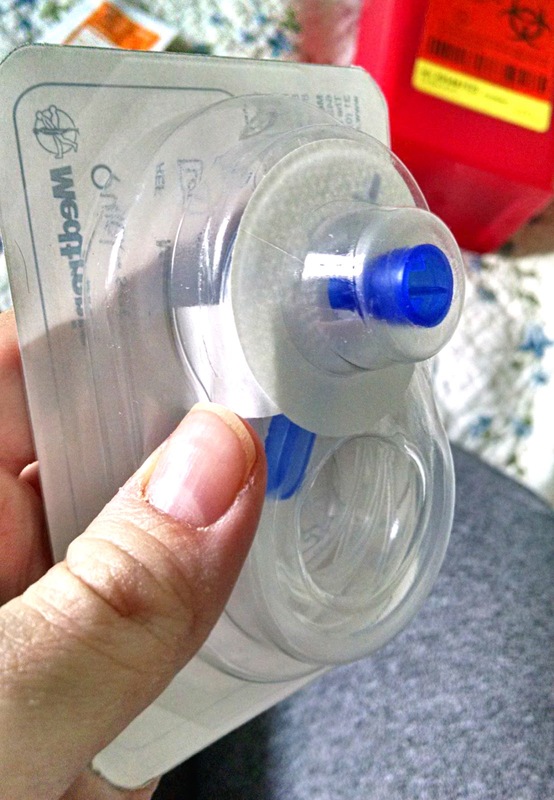 So, here is a tutorial for how to use my weird pump, in case your home health company uses the same kind. (I think my nurse told me this one is usually used for chemo treatments, but I'd imagine there are other companies that use it for Zofran, too.) 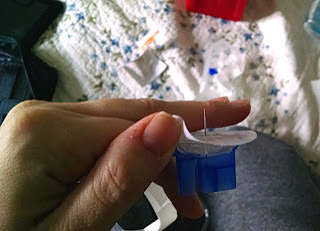 It is really similar to the other kind of pump that is used, but it's actually easier to switch medicine cassettes (no loading of syringes necessary!). So, without further ado...let's dive on in! 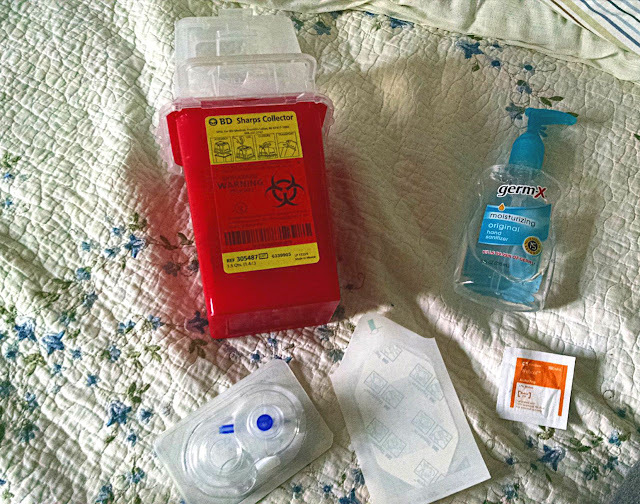 Here's what my set-up looks like, when I'm gathering supplies for a site (the place where the catheter is inserted in my skin) or cassette (the actual case with the medicine, which doesn't get changed every day) change. I'll walk you through each item step by step. 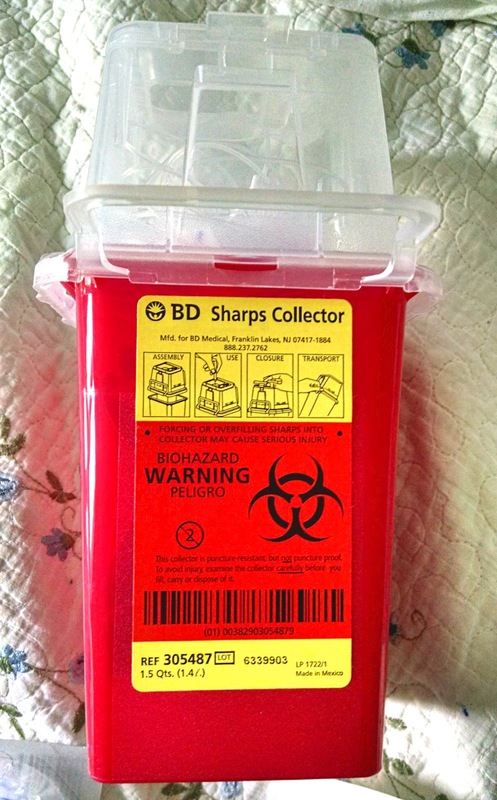 This is the sharps container. You can't just throw your used needles away in the trash, so you have to put it in this handy container. 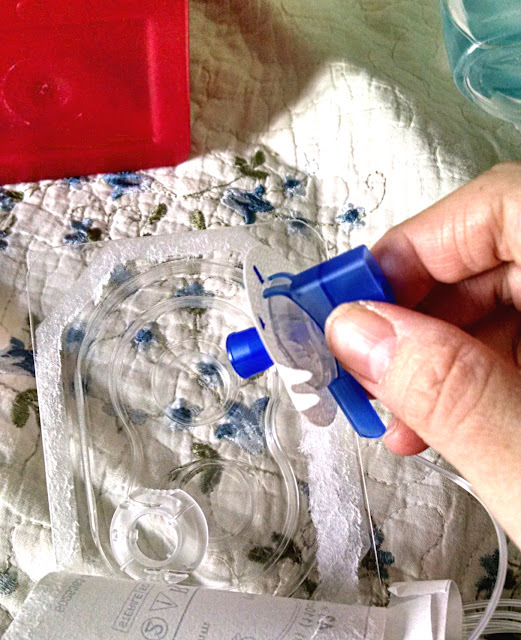 I usually put in my used catheters, too, since that's a biohazard type waste, but I don't know if everyone does that. When it gets full, you give it back to the home health company and they bring you another one. One of my weird triggers this pregnancy is washing my hands. 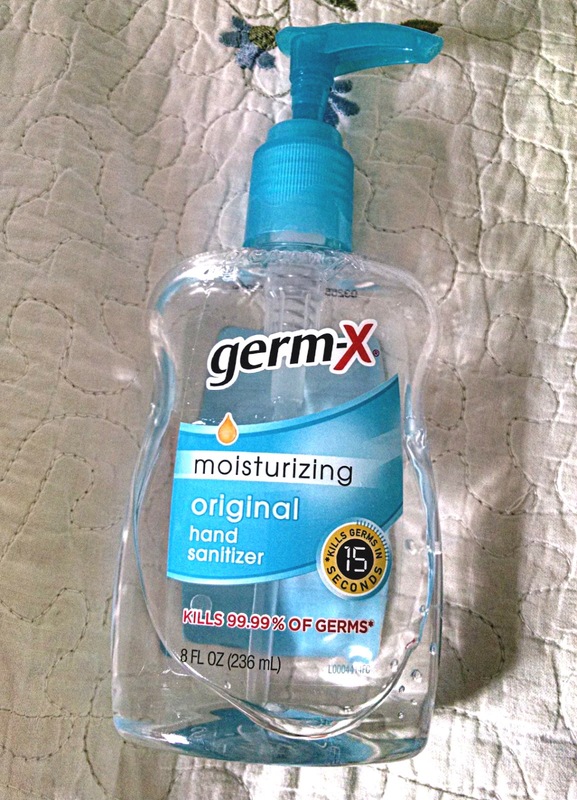 Thankfully, I can wash my hands with soap and water most of the time now, but there was a stretch where I could only wash them in the morning and had to resort to hand sanitizer to avoid puking from the feeling of water on my hands. Why am I tell you this? Oh, right...just reminding you to wash your hands or use hand sanitizer before you change your site! 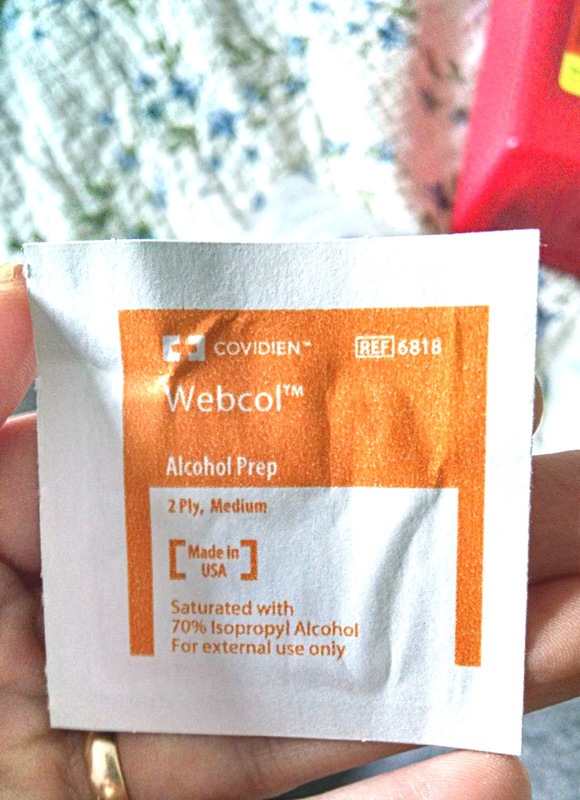 An alcohol wipe so you can get your skin super clean like the nurse always does before you get a shot. You get to pretend to be a nurse, lucky dog! Tagiderm. It's a clear, plastic kind of tape that covers your site once your catheter is inserted. It didn't give me huge problems when I first started using a pump, but now it's super itchy. You can always talk to your home health nurse for suggestions for dealing with the itchiness, but I find putting regular lotion on old site usually soothes the skin. This is your actual sub-q site set. It has the tubing and needle you need to get hooked up to the good stuff. Step 1: Stop the pump! This means that no Zofran will be pumped out when you disconnect the tubing. Step 2: Get set up to prime the tubing in a minute. I kind of felt like a genius when I figured out how to do this. 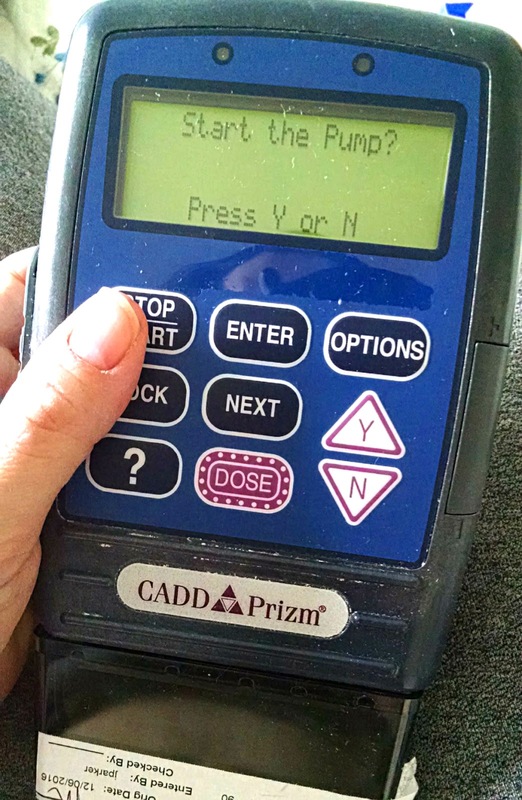 My nurse couldn't figure it out, either. 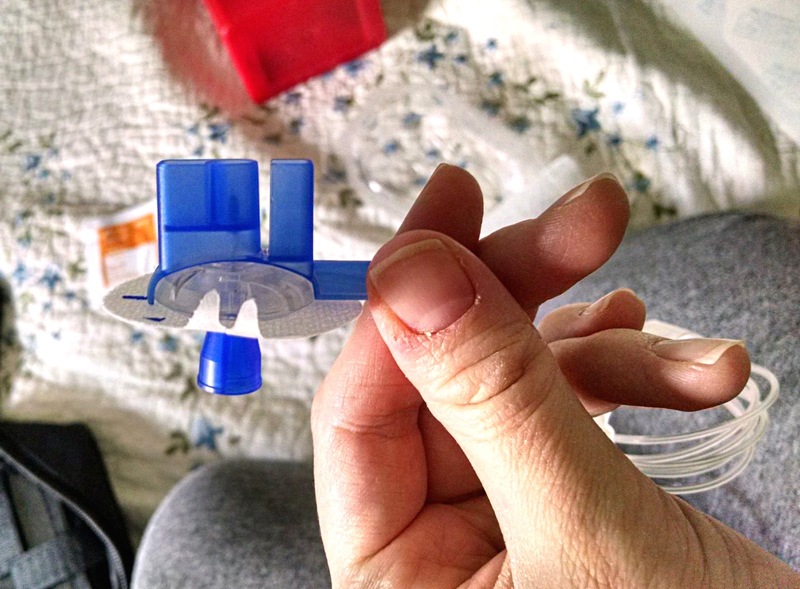 I used to have to completely unlatch the medicine cassette to get the option to prime the tubing. 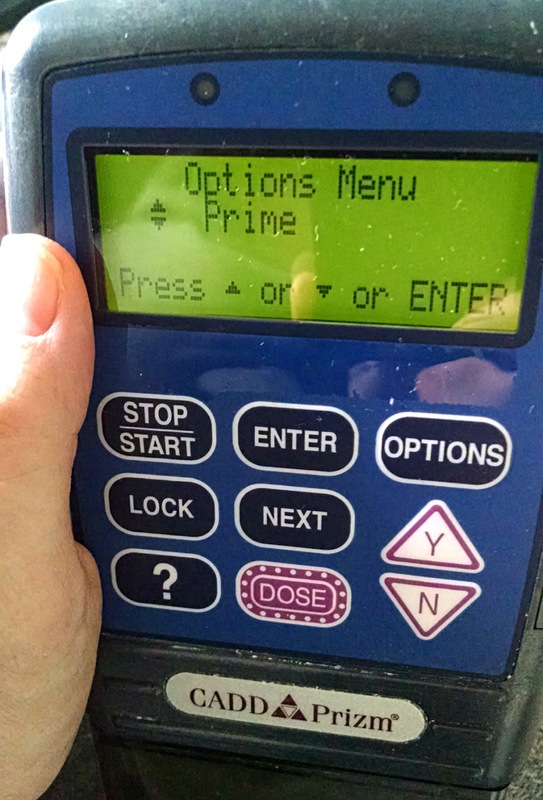 Then, I realized that when the pump is stopped, you can select options, press enter, and you're all set to prime. Woo-hoo! This is how the screen will look when you hit enter. Don't click the Y button yet! You're all set to prime the tubing once she switch to the fresh one. This is how your site looks when you open it. I have no idea what the point of that plastic circle on the bottom is, so please enlighten me if you do know. The cylinder at the top of the tubing is what we're after here. DO NOT touch the cylinder itself! To attach the new tubing, hold the actual tubing, not the cylinder. If you touch that little cylinder, disinfect it with alcohol or alcohol wipes, so it's sanitary, again. Step 3: Switch the tubing. On the left, you can see a thicker tubing and a thicker cylinder (you can touch the outside of that one, but not the inside). One the right, you can see the littler cylinder (the one you can't touch) and the thinner tubing. 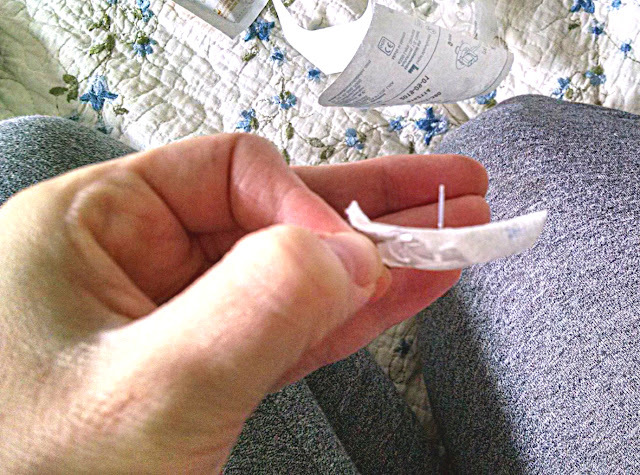 The thicker tubing is what is attached to the medicine cassette. 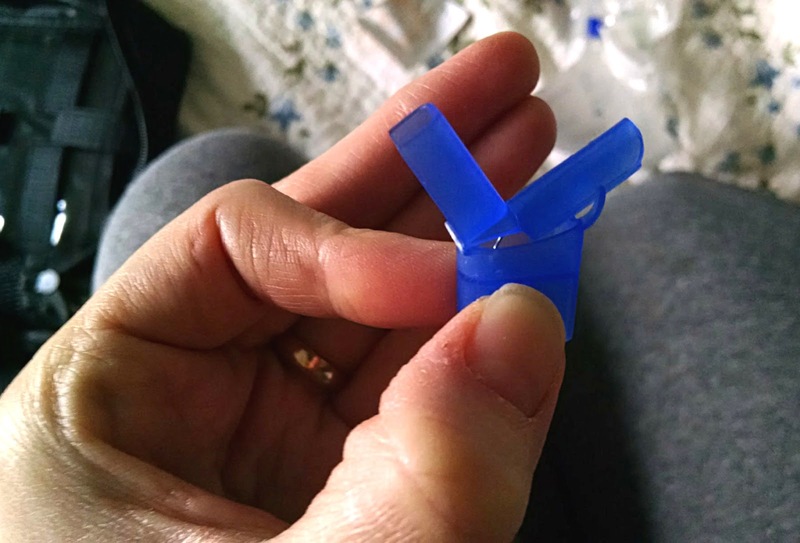 The thinner tubing is attached to the site. When you switch sites to a fresh one, you want to unscrew these tubes from each other, and screw in the new tubing to that thick tubing. Confused yet? When you're done, it'll look like this again. Step 4: Prime your tubing. Right now, your new tubing is filled with air, and you don't want air or air bubbles in your tubing. 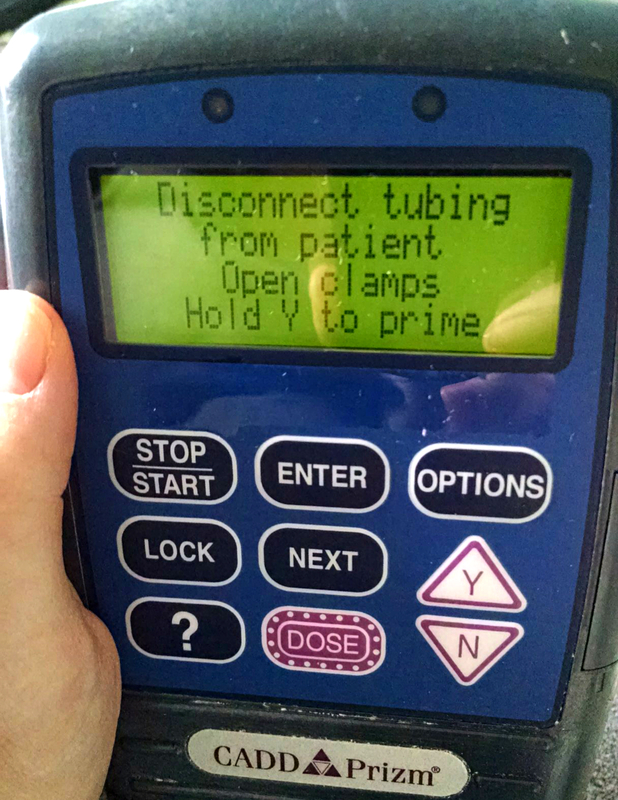 To avoid that, you "prime" it, or pump a small amount of medicine through the tube to fill it up. 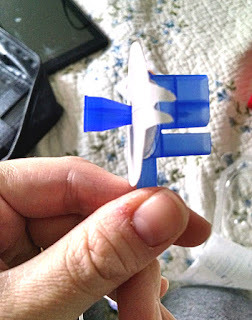 This is the side view of the catheter/needle. The blocky looking thing on the right is what you pinch and retract once you have successfully inserted the catheter into your skin. The left blue part is covering up the needle encased in the catheter. Once the catheter is inserted, the needle is retracted from your skin. See the little needle in the center there? To prime your new catheter once you're hooked up to the medicine tubing, point the needle downward (into your plastic case that the site came in, or on to a piece of tissue), and click the "Y" button on the pump. I usually have to press it three times before I see a spurt of medicine come out of the tube. Once you see that, you know that the tubing is air free! Once your tubing is primed, peel off the sticker from that white circle around the needle, and take off the blue cap. This is the needle you're going to put into your belly (or leg...but belly is usually easier because the skin is less tough). It's tiny, isn't it??? Not scary. If you relax and pinch a really large chunk of skin (pinch an inch) you usually won't even feel it going in. Even if it does sometimes hurt, it's quick and not too bad. You can do it! 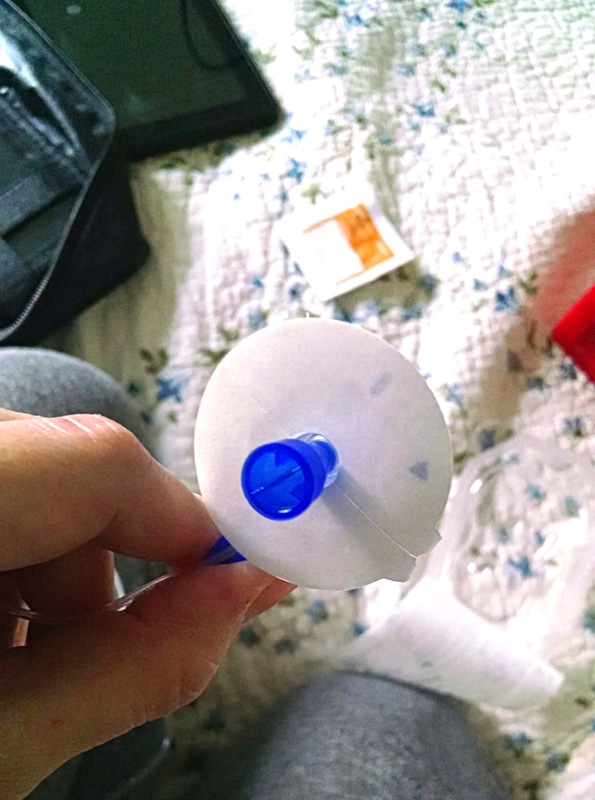 Before you insert the needle, pick a spot on your belly, rub the skin liberally with the alcohol wipe, pinch and inch of skin, relax, and stick the needle right in the middle of the pinched skin. Relax and put it in straight, and you'll do great! When you pinch the top, the needle retracts and looks like this. Thankfully, that whole thing doesn't have to go in your belly! You only put in the tip. And you're done already! You're a champ. Click that top left tab over the top of the needle. 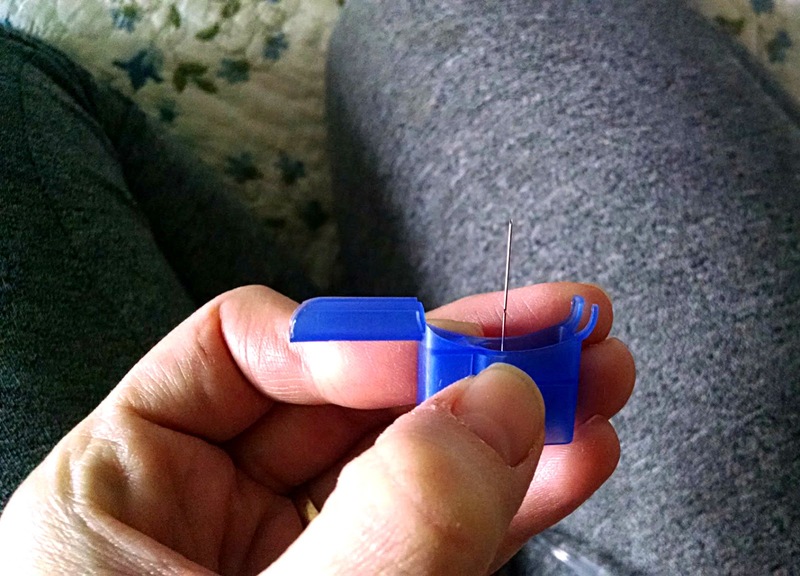 And throw that used needle away in your sharps container! This is what the site looks like when the catheter is inserted! 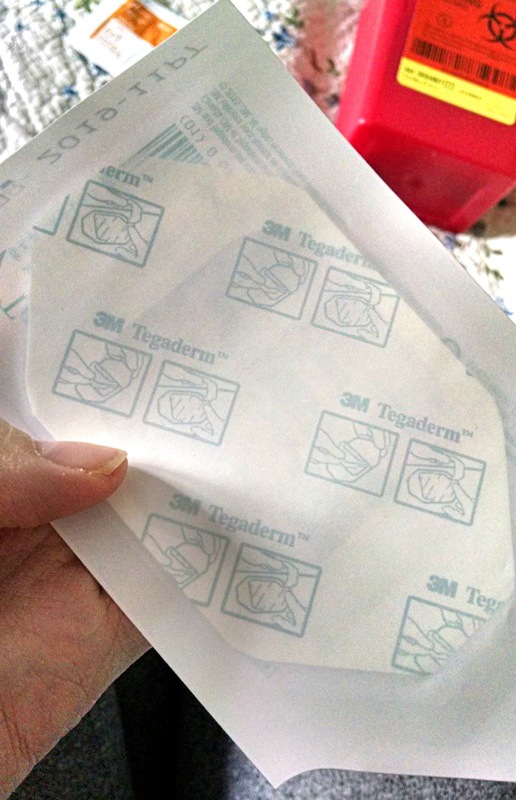 Put the tagiderm tape on top and you're good to go. I'm not showing you my whole bruised and welt covered belly because I'm too modest, so you just get to see this little corner. I usually alternate sides of my belly for sites. Because Zofran is a skin irritant, it causes redness, bruising, and welts, and the sites need to be changed often. I find once a day or so usually works well, but some moms need to change them more frequently. The irritation is a small price to pay for keeping food down and being able to talk and sit upright! It isn't fun, but it isn't awful and you kind of get used to your stomach looking like a punching bag. Icing old sites or applying heat can help. After you install the new site, you'll still have the old site and tubing hanging off of you. Pull that out of your belly, and it will look like this. Just a tiny little catheter! The catheter is stiff, but somewhat flexible. If you insert it correctly, it should cause pain once in (although occasionally the Zofran will sting when first pumped in). If it's really hurting, it's time to switch your site! Sometimes a tiny bit of clear liquid or a few drop of blood will come out of the old site (especially if it was getting really irritated and not absorbing the medicine well). Sometimes nothing comes out. 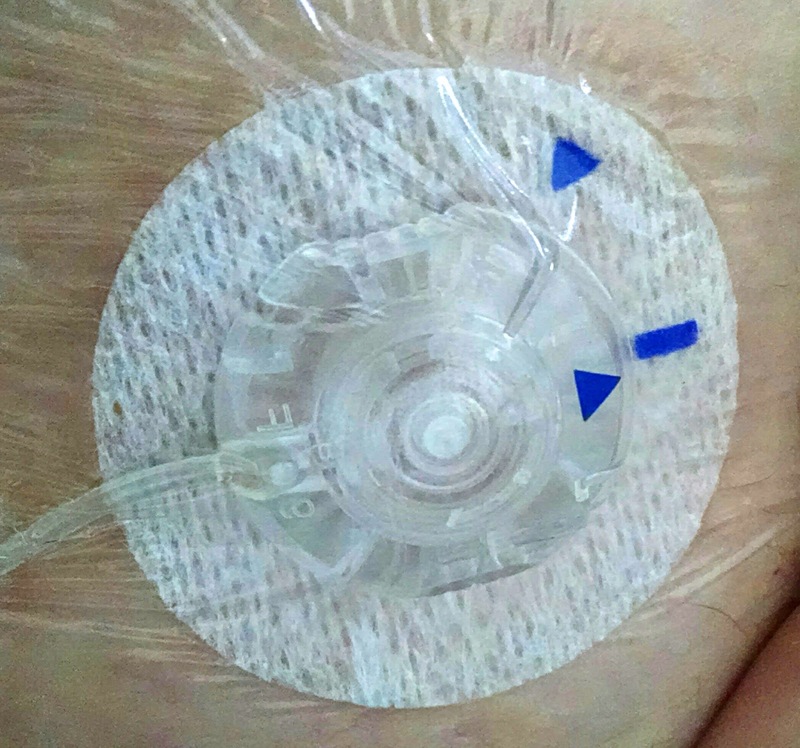 Some women like to squeeze out excess Zofran after removing the catheter. Do whatever works for you. You shouldn't need to put a bandaid on it. (I have only briefly needed to once, when the site was just a really bad placement and ended up bleeding a lot when removed. That is not normal, and probably won't ever happen to you....but don't freak out if it does. The bleeding should still stop fairly quickly.) 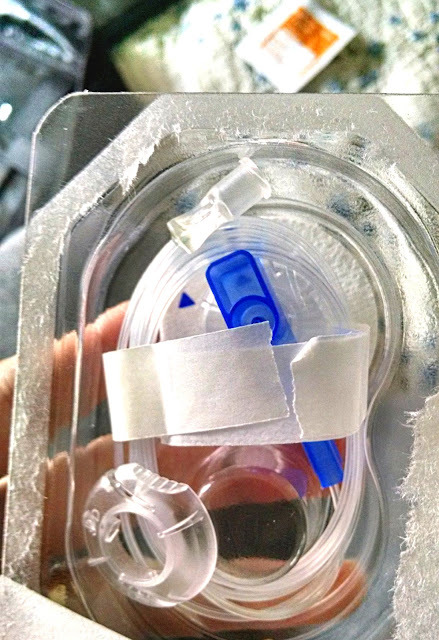 I always throw my old catheter away in my sharps container. Start the pump, and you're good to go! 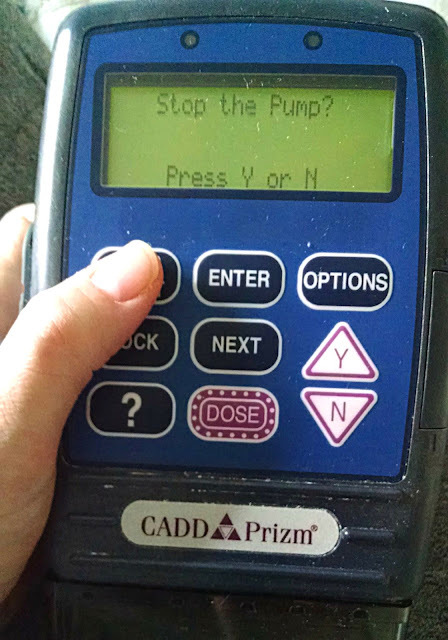 The first pump of your Zofran may sting at your new site, but don't worry...it usually won't sting after the first pump. If it keeps stinging a lot, you might want to just switch sites again. This is what the screen looks like when you are all done! 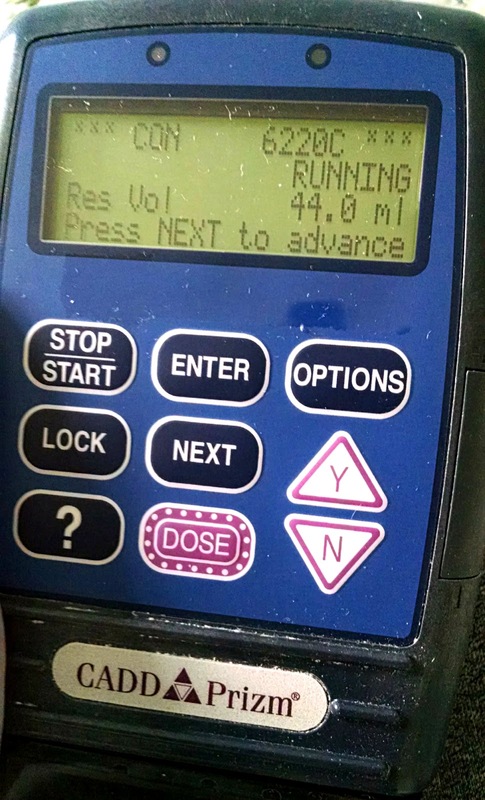 You want to make sure it says, "running" and also check the reservoir volume number, so you know when you'll have to change it. Note: if you change the battery (it will beep to tell you when you need to) it will reboot as "stopped" not "running." So always make sure your pump is actually pumping! Then zip up your case and you're good to go! Anyone who has seen me up and about recently has seen me with this trusty case slung over my shoulder. That's it! Changing the medicine cassette is basically the same process, except you have to unlatch the reservoir by turning a dial on the side. The reservoir pops out and you pop a new one in. Other than that, the whole process is basically the same. You can do it! And I hope it helps you as much as mine has helped me. Fight on, warrior mom! You've got this! I just got my pump today and I'm happy to know that the red skin irritation is normal. It feels like a giant bruise but its red! I also have an iv in my arm so that's fun! 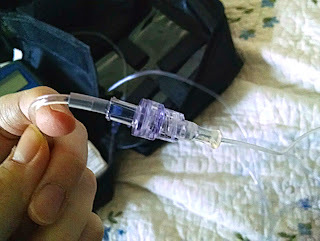 It make me feel much better seeing this blog with the same pump I have so I know everything I'm seeing and feeling is normal. One thing I'm curious about is how did your doctors handle fundal checks with a bruised and welted belly?